After the cancellation of the MiG-29K and Su-27K, the Soviet Navy decided to adapt the two seater Yak-38U conversion trainer in to an all weather fighter. The result was the Yak-38bis. Here, two Yak-38bis aircraft intercept a US Navy Lockheed P-3 Orion in the late 1980s as it gets a little close to their Kiev-class carrier. Two Soviet MiG-17s roar triumphantly over St. Paul’s cathedral as the Red Army’s troops celebrate the capturing of the city. Almost fifty per cent of the Red Army’s troops are within the city’s limits to make sure that the city stays one of the Soviet’s trophies like Paris and Berlin. 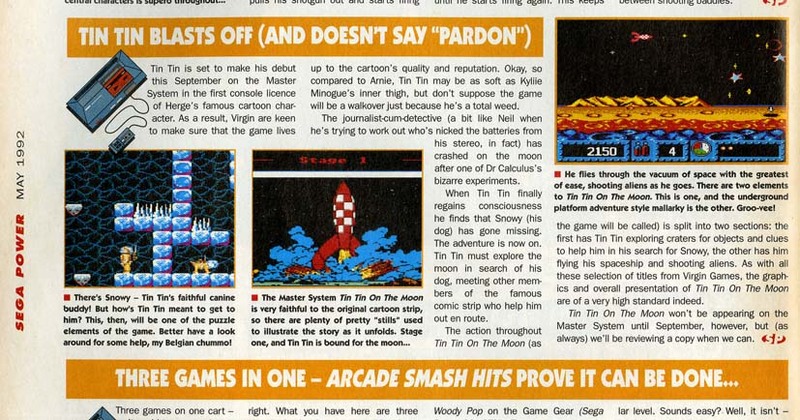 Tintin on the Moon was one of a number of unreleased titles for the Master System. I have been unable to find much information on the game’s development and subsequent cancellation but what I do know is that it was promised in an article published inside Sega Power magazine’s May 1992 issue to be released in September of that year. The game was described as being part side-scroller and part space shooter. Similar versions of the game were released on a number of other consoles by Infrogrames including on the obscure AMSTRAD GX4000. To make this box art I essentially took a screenshot of the original graphic novel the game was inspired by and put it in a Master System context. I talked in the previous post to this one about the Sega 32X so I won’t repeat myself here. You can view the previous post by clicking here if you wish. Here are some more games that were at some point planned to be on the Sega 32X but fell off the drawing board during the add-on’s short and disastrous lifespan. They did however appear on other Sega consoles in some form or another. I have made the following fake box covers to show how they may have looked on the shelf and have included both US and EU styles. A well known but hardly loved racing game, Daytona USA was one of the stalwart titles that landed on the Sega Saturn. Every bit a game of the 32-bit generation it actually began life in the arcades and in that medium was a much more enjoyable experience. It was so successful that Sega decided to make it a launch title for the Saturn but due to time constraints it was rushed through development and as such was a poor substitute for the arcade. A Sega 32X version of the game was mentioned in the magazine Mean Machines Sega issue number 40 published in February 1996. After that it was never mentioned again. Remember the Power Rangers’ poor relation? No…Just me? Anyway, like Power Rangers Saban’s other Japanese/American hybrid, VR Troopers, cashed in on the kung-fu kid’s craze at the time and that meant merchandise. LOTS of it. For a time VR Troopers and Power Rangers were fighting each other for shelf space at Toys ‘r’ Us as well as battling monsters every week. And what happens when something gets plugged as much as this? Well, more often than not you get a lot of crap. I own a copy of the Mega Drive version of this game which the 32X version would have been developed from. Believe me when I tell you it is terrible. The cutscenes and artwork are very well done but the actual gameplay is just appalling. It’s clunky, unresponsive and extremely biased toward your computer opponent. Fans of the Sega 32X should not be disappointed that they didn’t get this one. The delightfully named Boogerman: A Pick and Flick Adventure was a 2D platform video game created by Interplay Entertainment and released for the Sega Mega Drive/Genesis in 1994. I never played Boogerman back in the day and first heard of it researching this post. It was one of the Mega Drive’s last games before the 32-bit era really kicked in to gear and as such it looks amazing as 16-bit games go. They really knew how to push the console’s ageing processors by that point. The 32X updated version was another story that appeared in Mean Machines Sega and then quietly disappeared off the face of the Earth. As good as it looked already I can’t really see what the 32X would have done to improve the game except of course if they added a few bonus levels like they did in the Mega CD version of Ecco the Dolphin that used the system to its full. 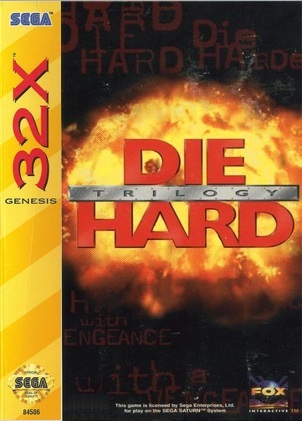 A small number of games were released that were designed to use both the Sega Mega CD and the Sega 32X add-ons combined. These games therefore represented the maximum power the Mega Drive/Genesis was ever capable of. Six Sega Mega CD 32X games were released in total with the CD 32X version of Surgical Strike being available only in Brazil. There were a handful of other games planned to utilise both add-ons that didn’t see fruition and one of those was the very ambitious Wirehead. One of the last Sega Mega CD games released it starred Steve Witting as a mild-mannered family man who has a wireless device implanted into his brain. The player guided Ned by manipulating his brain–computer interface by responding to an audiovisual prompt similar in concept to games such as Road Avenger and Cobra Command. These prompt-games were both the biggest criticism of the Sega Mega CD and the biggest part of its charm. For me they are something of a guilty pleasure and having seen the improved look of Sega Mega CD games such as Night Trap using the 32X add-on it is a shame that more games didn’t take advantage of the Mega CD 32X. That being said by that time in history the Mega Drive, the Mega CD and the 32X were all dying machines and history would have continued to pass over them regardless. I plan to follow this series up with a third post that covers my choices for great Mega Drive games that would have been even better on the Sega Mega CD and/or 32X. Ok – few consoles have flopped so dramatically as the Sega 32X (Sega Mega Drive 32X here in the UK and Europe). I can see where Sega were going with the idea and had it come out about two years earlier and not been as messy to plug in to your Mega Drive/Mega CD (which required 3 AC adapters if you had all three!) then it might have been a success. 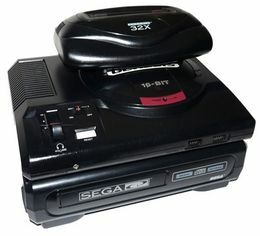 In reality it came at a time when new consoles like the Sega Saturn, Nintendo 64 and the mighty Sony Playstation made the Sega CD 32X combo look like the Frankenstein of gaming. Nevertheless Sega had high hopes for it…At least at first. As the add-on was launched in late 1994 there were a huge number of titles planned for it many of which didn’t see the light of day on the 32X. Many did see life on other consoles however and are quite well known and loved games. Could they have saved the 32X? No. The fact of the matter is a Genesis/Mega Drive add-on was looking backwards and gamers wanted the shiny new systems which Sega soon realised when it dropped support for the 32X less than two years later. Nevertheless the box art I have tried to replicate here for the 32X gives us an idea of what these would have looked like on the shelf. Alien Trilogy remains one of the best video game adaptions of the Alien franchise. I had the Sony Playstation version and I remember the sheer eeriness of running around in the first person viewpoint with my gun waiting to be savaged by a Xenomorph or a facehugger. I actually rediscovered that feeling this very Halloween as I played it again with my brother-in-law and while the graphics are obviously dated everything else is as good as it was back then. It still stands up well today. 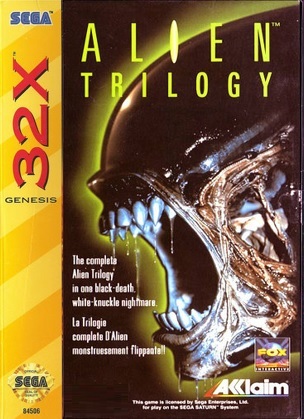 Alien Trilogy for the 32X was announced in March 1995 but then quietly disappeared. Unless there was a CD 32X version then the cartridge-only game could never hope to live up to the same standard as the Sega Saturn and Sony Playstation versions. Gameplay wise I would expect it at least look similar but who knows. Bug! was released on the Sega Saturn in 1995. Having seen the writing on the wall back then I switched allegiance from Sega to Sony trading in my Mega Drive for the Playstation so I have never played this. The game is described as a 2.5D platformer meaning that for the most part the game plays like a traditional 2D platformer akin to Sonic the Hedgehog (who actually makes a guest appearance in a bonus stage) but there are times when he can move closer or further away from the screen hence the “2.5D”. Having seen video and screencaps of the game I could quite easily see this game on the Sega 32X. It isn’t too taxing on the old processors although again being a cartridge the sound wouldn’t be up to the Saturn version’s standards. I have put this cover in the style of the UK version. Oh boy the nostalgia goggles are thick on this one. If you have never played it the game is actually three smaller games each based on each of the three original movies and encompassing different genres. That in itself is nothing new but what was great about it was that all of them were highly playable, thoroughly enjoyable and felt like full games in themselves. 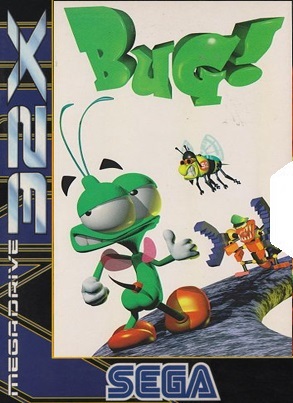 Like Alien Trilogy this was one of the games that defined the early 32-bit era and is a must-have on both the Playstation and the Saturn. What I never knew until researching this article was that this game was actually going to be one of the last Sega Genesis/Mega Drive games and when I thought more about it I could definitely see it on there. The polygons are quite Virtua Fighter which the Mega Drive could just about handle so it shouldn’t have been too taxing for the 32X to handle. 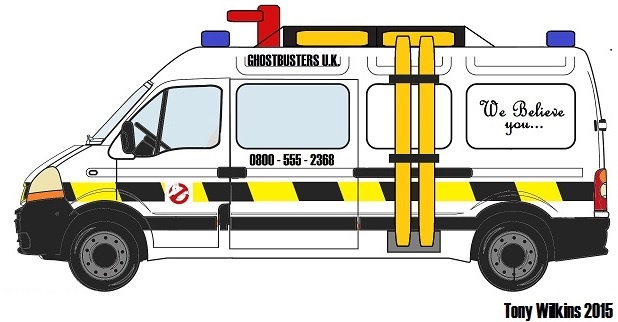 I can’t help but wonder what playing Die Hard 2 with the Sega Menacer would have been like. Don’t judge me…I will let that sink in for a minute as you realise that YES I am that guy…but I actually enjoyed the movie. I know it had about as much to do with the comic books as a tin of soup but at least it was more faithful to its source material than the Street Fighter movie. There are two possibilities as to what this game was. It was either a 32-bit upgrade of the Genesis/Mega Drive game released in 1995 or perhaps less likely an earlier version of the 1998 Playstation game. The former seems most likely to me and if that is the case then this would have been a run-and-gun game not too dissimilar to another Sly Stallone game Demolition Man. 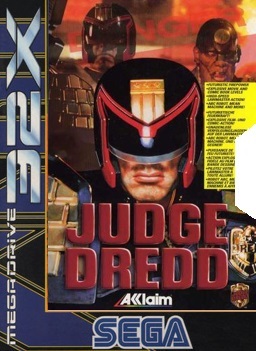 I have played the Sega Game Gear version of Judge Dredd and it was nothing to write home about. So there we have it. Four rather familiar game titles that could have ended up on the Sega 32X. There are many others and I may make box art for those too as well and perhaps some “fantasy ones” for myself. Hope you have enjoyed this little trip in to the mirror universe.